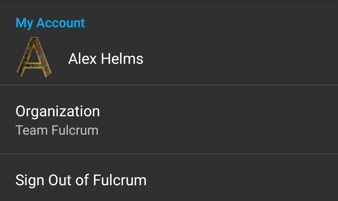 An overview of the settings options found in the Fulcrum for Android app. The app settings screen is not just for fine tuning Fulcrum for your use. This is also where you will change custom layers and/or download them to your device, sign out of your account, and much more. To access the Fulcrum settings page you can click on the settings button on the right side of the bottom menu bar. View the account and organization context you are currently using. You can switch which plan you are accessing if you are a member of more than one plan by tapping the organization that you are currently accessing. In addition, this is where you can sign out of Fulcrum to switch to a different context. The map view options is where you can enable and upload custom layers to Fulcrum. At the top of the view view section is an option to filter the list view based on map view. 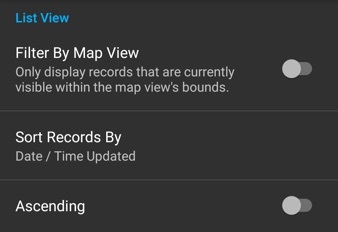 When enabled, the list view will only display records that are visible on the map view. Next is the list view sort options, which allows you to sort by title, status, date/time created, or date/time updated. Also you can change between the sorting order. 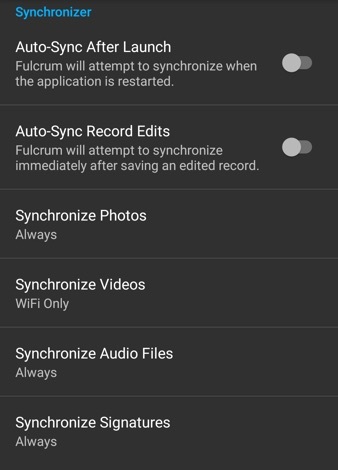 Below the two auto-sync options are the various Media Sync options. 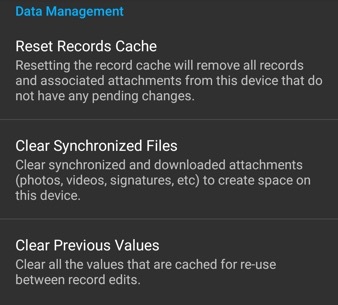 These options allow you to set the sync settings for your media. This includes: photos, videos, audio files, and signatures. You have three sync settings to choose from for each of the media types: Cellular or WiFi, WiFi only, or Never. Adjust the photo quality setting between available quality settings: Native, High (1080), Medium (720), and low (480). Depending on the camera app’s quality setting, Fulcrum may downscale the photo to the quality setting set in Fulcrum. If the quality setting in the camera app is lower than the setting in Fulcrum than no upscaling will occur to the photo. When Save to Gallery is enabled, a copy of the image taken will be stored locally in the gallery app. The about page contains the Fulcrum version, support, and terms of service information. As well as, some additional tools & utilities. The backup database function will create file that you can share with us in the event that there is an issue with the normal means of syncing your records to the Fulcrum server. Database Export: This tool will create a copy of the Fulcrum database and store it on the external storage of this device. The backup is intended for developer troubleshooting only and cannot be directly imported into Fulcrum. 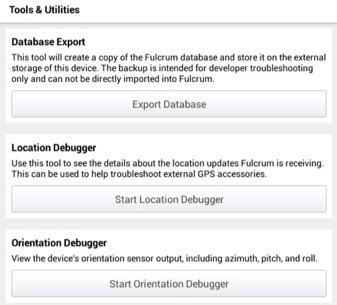 Location Debugger: Use this tool to see the details about the location updates Fulcrum is receiving. This can be used to help troubleshoot external GPS accessories. Orientation Debugger: View the device’s orientation sensor output, including azimuth, pitch, and roll.